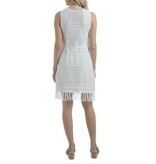 Our Sabra Crochet Dress is the perfect summer staple. The lightweight, sleeveless style is crafted from a beautiful crocheted knit and fully lined for comfort and coverage. Cinch the tie at your waist for an hourglass shape, or wear it loose for a more retro vibe.